Oort Cloud comet Siding Spring made its closest pass to Mars and the Mars Reconnaissance Orbiter (MRO) on Sunday, 19 October 2014. The highest-resolution images were acquired by HiRISE at the minimum distance of 138,000 kilometers. The image has a scale of 138 meters per pixel. Telescopic observers modeled the size of the nucleus as about 1 kilometer wide. However, the best HiRISE images show only 2-3 pixels across the brightest feature, suggesting a size smaller than 0.5 kilometers for this nucleus, the first ever imaged for a long-period comet. 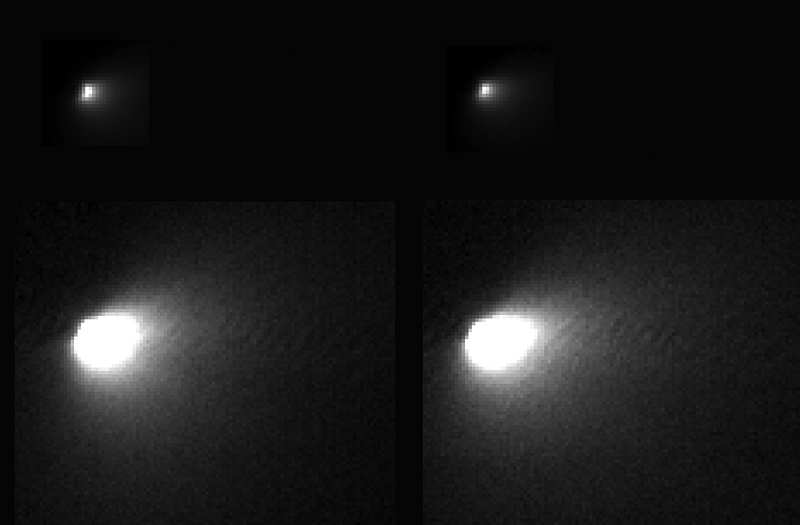 This composite image shows two of the best HiRISE images of the comet. Shown at top are images with the full dynamic range, showing the nucleus and bright coma near the nucleus. Shown at bottom are versions where the fainter outer coma is brightened, saturating the inner region. These closest-approach images were made possible due to very precise pointing and slewing of the MRO spacecraft by engineers at Lockheed-Martin in Denver, based on comet position calculations by engineers at JPL. HiRISE acquired three images 12 days before closest approach, when the comet was barely detectable above the “noise level” of the images. These early images showed the comet was not quite at its predicted location! This new viewing angle on the comet was used to update its predicted location and timing at closest approach. Without this update, the comet may have been outside the HiRISE image area in the best images.